I wrote about Kaczmarksi in Week Six of the Prospect Watch and theorized he was next in line to receive the call. Well, news broke late Thursday night that Kaczmarski had been scratched from the Vegas lineup and would instead be flying to New York, along with teammate Drew Smith, to join the big league club on Friday. A 2015 ninth-rounder by way of the University of Evansville, Kaczmarski didn’t reach Double-A Binghamton until his age-25 season. The batting average (.274) and on-base percentage (.370) were fine, but his five home runs in 452 at-bats and .369 slugging percentage were not. Kaczmarski doesn’t possess even average game power and has a fringe arm, making him a non-traditional fit for right field. He doesn’t have the requisite speed for center and doesn’t profile as a regular there, either. That leaves left field as his likely position, but a complete lack of power presents quite the challenge. If he’s not a plus defender in left, where is his value coming from? While his strikeout to walk ratios have been very encouraging, we need to take those with a grain of salt considering Kaczmarski has been old for every single level he’s played at, besides his 24 games with Las Vegas this season. Even in the high octane offensive conditions out in the desert, Kaczmarski has just five extra-base hits in 80 at-bats. Does this sound like a promising young player to you? Kaczmarski’s receiving a considerable amount of hype that’s unjustified in this writer’s humble opinion. There’s no carrying tool with the bat and while the approach may be above average, major league pitchers will have no problem attacking him if they know they won’t be punished for it. I think the Kaczmarski hype is more of a product of the sad state of the Mets than anything else. Mets fans are willing to blindly throw support behind an outfielder with just five home runs in 559 at-bats above Single-A because they think he can’t possibly be any worse than Jay Bruce. Here’s a spoiler alert: Kaczmarski is a role 3 (organizational depth), and I don’t expect any better than a 2018 Jay Bruce line (.212/.292/.321) from him. 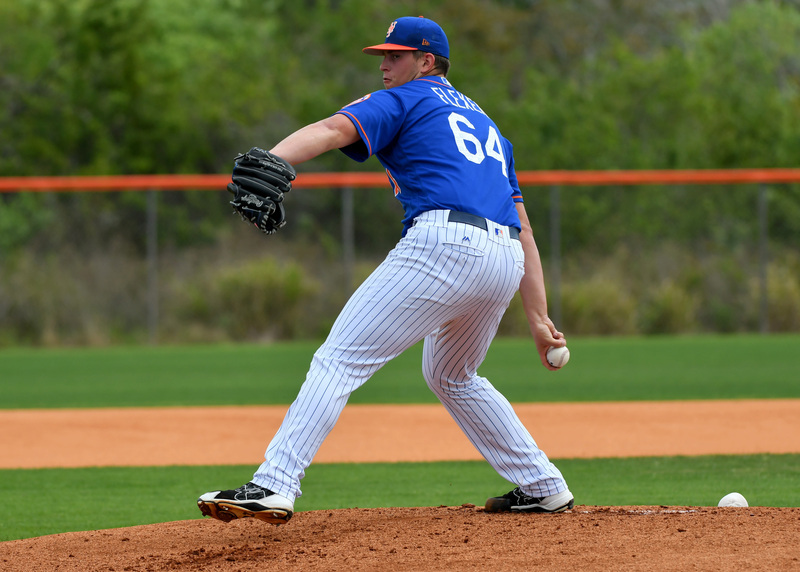 While Flexen was never a top Met prospect, the prevailing thought was that he could eventually settle in as a fourth or fifth starter if his command improved. Well, Flexen’s command still comes and goes in spurts, and his problems seem exasperated whenever he pitches for the big league club. He walked 35 batters in his 48 innings with the Mets last season and has walked three batters in 2.1 innings with them this season. In what now seems like a fluky 2017 season split between Port St. Lucie and Binghamton where he only walked 10 in 63 innings, Flexen earned considerable hype as the next Mets pitcher to exceed everyone’s expectations. He still has a fastball that sits in the low-to-mid-90s and a four-pitch mix, but he looks like a middle relief option instead of a starter at this point. Now, that’s actually a great outcome for a 14th round pick, but more was expected from the 6’5” right-hander. He seems destined to ride the Mets bullpen shuttle from Vegas to New York for the rest of the season. With the Mets short season teams starting play this week, I figured this would be the perfect opportunity to discuss some noteworthy prospects that are way down on the farm. Kendall Coleman is not one of them. The return from the Yankees for L.J Mazilli, Coleman was an 11th round selection in the 2013 draft. While he has battled some injuries, he hasn’t played above A ball and is repeating the New York Penn League for the third straight season. We’re now approaching 800 career at-bats of data for Coleman and his career slash line sits at a paltry .207/.307/.303. So, why are Mets fans hoping for a breakout season from Coleman? I don’t know either, because there’s nothing in the profile that suggests Coleman can improve and climb the minor league ladder this season. He did hit a grand slam on opening day for Brooklyn though, and that was apparently enough for Mets Twitter to hype him up as a toolsy outfielder that just hasn’t figured it out yet. There are better and more interesting prospects in the lower minors, so let’s focus on those and stop trying to hype every minor leaguer as a potential big leaguer, please. Gilliam was the Mets fifth-round pick this year out of Clemson and was promptly sent to Brooklyn, along with every other Day Two pick, to begin his professional career. Now, that’s a problem considering Gilliam is a reliever only and was lauded for his potential to move quickly through a minor league system. That’s presumably why the Mets spent a fifth-round pick on a college closer, yet here we are, on June 22, and Gilliam is sitting in Brooklyn’s bullpen. Gilliam threw 38.1 innings for Clemson this season, dominating ACC hitters to the tune of a .165 opponent batting average. He has the potential for two plus pitches (fastball and curveball) and while he needs to work on developing his changeup, he should be doing that in Columbia at the very least. Other organizations usually spend high picks on relievers they plan to fast-track to the majors. The Mets spend high picks on relievers they plan to send to short season ball. See the difference? Seriously, what even is the point of selecting Gilliam, who in reality should be ready to contribute by the end of 2019, if you’re going to send him to Brooklyn to begin his career? Let’s talk about another questionable assignment, this time with Vientos, who’s one of the Mets’ best prospects. The Mets took Vientos out of high school in the second round of the 2017 draft, and he was decent (.262/.318/.398) in his debut season split between the GCL Mets and Kingsport. Still just 18 years old, the Mets elected to have him start the season in Kingsport instead of Brooklyn. While Vientos wasn’t spectacular in rookie ball last season, the least the Mets could’ve done is send him to Brooklyn. Instead, they filled the roster with college performers and slowed Vientos development down. It’s true that all prospects develop at different paces, but let’s take a look at the Braves 2017 second rounder, Drew Waters. Waters, like Vientos, didn’t tear up rookie ball in 2017. But the Braves sent him the Sally League to begin 2018 and have been rewarded thus far with a .304/.353/.536 triple-slash. The Mets don’t move anyone fast, save Michael Conforto in 2015, and they seemingly have regrets about that transaction. It still doesn’t make any sense, but that’s why the Mets are who they are every single season. Moreno will turn 22 on July 31 and is still in Kingsport, but he might be kind of interesting? He reportedly hit 99 mph in his start Tuesday and was sitting in the mid-90s with his fastball in his six innings. Listed at a legitimate 6’4” and 165 pounds, Moreno has a ways to go to fill out his body. He also needs to work on developing his secondary offerings, which are far behind the fastball presently. While we shouldn’t read too much into the numbers because 99 mph is enough to overpower rookie level hitters, Moreno is an interesting name to follow. If things go right, he could develop into a useful arm. If things don’t, you’ll likely never remember his appearance in the Prospect Watch. Nevertheless, he’s a high upside arm in a system thin on them, so let’s keep an eye on Moreno and see if the Mets get aggressive with him (spoiler: they won’t).